Pojo's Dreamblade Mini's news, tips, strategies and more! Check out our Message Boards where you can trade figures, discuss warbands, discuss upcoming tournaments and a whole lot more. Tuesday, May 15, 2007 Our Mini of the Day is Abyssal Predator from Anvilborn. Duncan has a review for you today. from Anvilborn. Duncan has a review for you today. Tuesday, May 8, 2007 Our Mini of the Day is Mantlet from Anvilborn. Duncan has a review for you today. Thursday, May 3, 2007 Our Mini of the Day is Arsonist. Duncan has a review for you today. Tuesday, May 1, 2007 Our Mini of the Day is Aviax Cowboy. Josh has a review for you today. Friday, April 27, 2007 Our Mini of the Day is Octorilla. Chen Wan Lee, Duncan Wilson & Josh have reviews for you today. Wednesday, April 25, 2007 Our Mini of the Day is Baba Yaga's Hut. Duncan Wilson joins the Review Crew today and has a review for you. Thursday, April 19, 2007 Our Mini of the Day is Heart Thief. Chen Wan Lee & Josh "Thespian" Gatner have reviews for you today. Tuesday, April 17, 2007 Our Mini of the Day is Fleshworm Broodsire. Chen Wan Lee has a review for you today. Also, Josh "Thespian" Gatner joins the MoTD crew today. Welcome aboard Josh! Thursday, April 12, 2007 Our Mini of the Day is Buzzkill Clown. Chen Wan Lee has a review for you today. We could use some more volunteers for reviewing figures in the Mini of the Day section. If you want to volunteer as a reviewer, feel free to Contact Us. Tuesday, April 10, 2007 Our Mini of the Day is Book of Nothing. Chen Wan Lee has a review for you today. Friday, April 6, 2007 I was out all day yesterday, and missed posting Our Mini of the Day. So today you get two: Backalley Skuntch & Seraph. Chen Wan Lee & That Guy That Plays DreamBlade have reviews for you today. Tuesday, April 3, 2007 Our Mini of the Day is Aviax Firebrand. Chen Wan Lee has a favorable review for you today. Thursday, March 22, 2007 Our Mini of the Day is Murderous Widow. Chen Wan Lee has a favorable review for you today. Tuesday, March 20, 2007 Our Mini of the Day is Hiveling Overlord. Chen Wan Lee has a favorable review for you today. Thursday, March 15, 2007 Our Mini of the Day is Prince of Blades. Chen Wan Lee & Mod-Log have reviews for you today. Wednesday, March 14, 2007 Our Mini of the Day is Borg Penitent. Chen Wan Lee & Mod-Log have reviews for you today. Thursday, March 8, 2007 Our Mini of the Day is Temple Lion. That Guy That Plays DreamBlade has a review for you today. We also introduce you to a new Mini Reviewer .... Chen Wan Lee & Hurley join the crew today. Welcome! Wednesday, March 7, 2007 Our Mini of the Day is Windborne Blademaster. That Guy That Plays DreamBlade has a review for you today. Thursday, March 1, 2007 Our Mini of the Day is Equitar. That Guy That Plays DreamBlade has a review for you today. Tuesday, February 27, 2007 Our Mini of the Day is Warfang Keep. That Guy That Plays DreamBlade warms up to this fig. Thursday, February 15, 2007 Our Mini of the Day is spawns the passion figure Little Charmer from Chrysotic Plague. That Guy That Plays DreamBlade warms up to this fig. Tuesday, February 13, 2007 Our Mini of the Day is World Eater from Chrysotic Plague. That Guy That Plays DreamBlade takes a bite of this fig. Friday, February 09, 2007 Our Mini of the Day is Queen Chyrsota from Chrysotic Plague. That Guy That Plays DreamBlade helps us finish off the week. Thursday, February 08, 2007 Our Mini of the Day is Chyrsota's Chapel from Chrysotic Plague. That Guy That Plays DreamBlade has a review. Tuesday, February 06, 2007 Our Mini of the Day is Slaughterwheel from Chrysotic Plague. That Guy That Plays DreamBlade has a review. Friday, February 02, 2007 Our Mini of the Day is another new one from Chrysotic Plague, Medusa. That Guy That Plays DreamBlade has a review. Thursday, February 01, 2007 Our Mini of the Day is another new one from Chrysotic Plague, Boogeyman. That Guy That Plays DreamBlade has a review. Tuesday, January 30, 2007 Our Mini of the Day is another new one from Chrysotic Plague, Illuminati Pyramid. That Guy That Plays DreamBlade illuminates the stats on this one. Friday, January 26, 2007 Our Mini of the Day is another new one from Chrysotic Plague, Thrice-Crowned Androgyne. That Guy That Plays DreamBlade finishes off the week for us. Wednesday, January 24, 2007 Our Mini of the Day takes another look at a Chrysotic Plague Shimmersword Sergeant. That Guy That Plays DreamBlade has another look. Monday, January 22, 2007 Our Mini of the Day spawns its way into the new set Chrysotic Plague with the figure Akiza Champion. That Guy That Plays DreamBlade checks him out. Friday, January 19, 2007 Our Mini of the Day wraps up Janus Week by spawning of the madness figure Unspeakable Brothers. Charninja's has something to say. Thursday, January 18, 2007 Our Mini of the Day continues Janus Week with the spawning of the valor figure Sir Glorious. Check out Charninja's review. Monday, January 15, 2007 Our Mini of the Day opens up Janus Week by spawning the Base Set Madness figure All-Seeing Mage. You can see a review from Charninja. Friday, January 12, 2007 We have our last Mini of the Day exclusive preview from the upcoming Chrysotic Plague expansion. Let's spawn our Valor figure of the day, Pearlthorn Dragon Knight. Charninja checks in to finish off this week. Thursday, January 11, 2007 We have another Mini of the Day exclusive preview from the upcoming Chrysotic Plague expansion. Today, we spawn the Valor figure, Shimmersword Sergeant. That Guy That Plays DreamBlade and Charninja see if this guy is worth saluting. Check back tomorrow for one more exclusive Mini preview! Tuesday, December 20, 2006 Our Mini of the Day Review today is Whirlwind Dervish a Valor figure from the Base Set. Charninja and Rolf the Ruf check the spin on this card. Friday, December 15, 2006 Our Mini of the Day Review today is Jack-in-the-Box a Madness figure from the Base Set. Charninja closes the lid on this one. Thursday, December 14, 2006 Wizards of the Coast invited readers to submit questions for them to answer about Dreamblade. We collected some and submitted them to WotC. Today, they've come back with answers to your questions. They answer 8 questions in our News Section today about future options for themed sets, Canada/Europe/Australia OP, “limited” format OP events, the possibility of Dreamblade Online and more. We'll be collecting more questions in the future, so submit your question on our Message Board. Wednesday, December 13, 2006 Our Mini of the Day Review today is Greenlife Dryad a Passion figure from the Base Set. Charninja checks this one's true colors. Monday, December 11, 2006 Our Mini of the Day Review today is Darkheart Cottage a Madness figure from the Base Set. Charninja opens up the week. Friday, December 8, 2006 Our last look at 'the stars of the Anahiem 10K' today with our Mini of the Day Review. Too finish it off we have Spellbound Scissors, a Madness figure from the Base Set. That Guy That Plays DreamBlade and king atlantis have reviews. Thursday, December 7, 2006 More looks at 'the stars of the Anahiem 10K' today with our Mini of the Day Review. It's Hammerhead, a Passion figure from Baxar's War. That Guy That Plays DreamBlade and king atlantis have reviews. Wednesday, December 6, 2006 More looks at 'the stars of the Anahiem 10K' today with our Mini of the Day Review. It's Clawclan Scout, another Valor figure from Baxar's War. That Guy That Plays DreamBlade, Charninja and king atlantis have reviews. Tuesday, December 5, 2006 We continue with our week of 'the stars of the Anahiem 10K'. Our Mini of the Day Review is Virtuous Maiden, a Valor figure from Baxar's War. That Guy That Plays DreamBlade, Charninja and king atlantis have reviews. Monday, December 4, 2006 Chris McCreath of Gresham, Ore. captured the trophy at the Seattle 10K Event over the weekend. More details (& photos) in our News Section today. Gratz Chris! This is the start of 'the stars of the Anahiem 10K' week for our Mini of the Day Review. First up, we spawn a very prominent valor figure from Baxar's War, Kitsune! That Guy That Plays DreamBlade, Charninja and king atlantis have reviews. Be sure to check back daily because this also is the start of a mini a day every day! Friday, December 01, 2006 Our Mini of the Day Review spawns the fear figure Glaive Scorpion from Baxar's War. Charninja and That Guy That Plays DreamBlade close out the week with their reveiws. Thursday, November 30, 2006 Our Mini of the Day Review spawns the fear figure Baxar the Soul-Stitcher from Baxar's War. Charninja and That Guy That Plays DreamBlade sew together some reviews. Tuesday, November 28, 2006 Our Mini of the Day Review spawns the madness figure Gent from Baxar's War. Charninja put on his top hat and tails for this review. Monday, November 27, 2006 Wizards of the Coast invited readers to submit questions for them to answer about Dreamblade. We collected some and submitted them to WotC. Today, they've come back with answers to your questions. They answer 7 questions in our News Section today. We'll be collecting more questions in the future, so submit your question on our Message Board. Friday, November 24, 2006 Our Mini of the Day Review spawns the madness figure Lockjaw from Baxar's War. Charninja and That Guy That Plays DreamBlade open their mouths about this guy. Wednesday, November 22, 2006 Our Mini of the Day Review spawns the valor figure Raging Vanguard from Baxar's War. Charninja and That Guy That Plays DreamBlade rage on about this character. 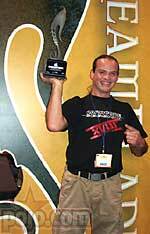 Monday, November 20, 2006 Nicolas Pilartz of Paris Wins the10K Event in Anaheim over the weekend. More details (& photos) in our News Section today. Gratz Nicolas! Our Mini of the Day Review spawns the valor figure Pearlthorn Gargoyle from Baxar's War. Charninja and That Guy That Plays DreamBlade both have a review. Friday, November 17, 2006 Our Mini of the Day Review spawns the valor figure Angel of Sunrise from Baxar's War. Charninja, That Guy That Plays DreamBlade and king atlantis has a review. Our Mini of the Day spawns the fear figure Crypt Worm from Baxar's War. Charninja has a review. Monday, November 13, 2006 We go Gambit for our Mini of the Day Review. Let's spawn the madness figure Cyclopean Sprite from Baxar's War. Charninja has a review. Saturday, November 10, 2006 Last week, Wizards of the Coast invited our readers to submit questions for them to answer about Dreamblade. We collected some and submitted them to WotC. Today, they've come back with answers to your questions. They answer 6 questions in our News Section today. We'll be collecting more questions in the future, so submit your question on our Message Board. Friday, November 10, 2006 Our Mini of the Day Review closes out the week with another Baxar's War. This one from Madness. We spawn Bogillian. Charninja, king atlantis and That Guy That Plays DreamBlade pick out a couple of reviews. Wednesday, November 8, 2006 Our Mini of the Day Review continues with Baxar's War. We spawn Naga Broodqueen. Charninja, king atlantis and That Guy That Plays DreamBlade do some deep brooding over this valor piece. Monday, November 6, 2006 Our Mini of the Day Review continues with Baxar's War. We spawn Silhouette. Charninja and That Guy That Plays DreamBlade cast a light on this character from Fear. Friday, November 3, 2006 Our Mini of the Day Review is from the new set Baxar's War. We spawn a big one today - Unsated RageDrake. Rolf the Ruf, That Guy That Plays DreamBlade and king atlantis both go big with this guy. Wednesday, November 1, 2006 Do you have any questions you want to ask Wizards of the Coast about Dreamblade? The future? Rules? Design? Well, now they're offering Pojo Readers a chance. Our Mini of the Day Review is from the new set Baxar's War. We spawn the madness of Marian, Bound to Pain. Rolf the Ruf, That Guy That Plays DreamBlade and king atlantis hook up with this piece. Monday, October 30, 2006 Our Mini of the Day Review is another location from the new set Baxar's War. We spawn Tower of Faces. Rolf the Ruf and king atlantis have reviews. Wednesday, October 27, 2006 Our Mini of the Day Review is a passion from the new set Baxar's War. We spawn Bloodhawk Barag. That Guy That Plays DreamBlade and Rolf the Ruf have reviews. Wednesday, October 11, 2006 Our Mini of the Day Review is from the Valor family. We spawn Flame Harrower. Rolf the Ruf has a review. Friday, October 06, 2006 Our Mini of the Day Review is from the Passion family. We spawn Forgeblind Punisher. Rolf the Ruf has a review. Wednesday, October 04, 2006 Our Mini of the Day Review is from the Fear family. We spawn Genteel Husk. Charninja and Rolf the Ruf have reviews. Monday, October 02, 2006 Our Mini of the Day Review is a pojo Sneak Peak EXCLUSIVE from the yet to be spawned set Baxar's War. Enter, Whirling Knifedancer. Charninja, That Guy That Plays DreamBlade and Rolf the Ruf with dervish like reviews. Friday, September 29, 2006 Our Mini of the Day Review is a Location from the Passion family. We spawn Heartsblood Temple. Charninja and Rolf the Ruf have reviews. Thursday, September 28, 2006 Our Mini of the Day Review is from the Valor family. We spawn Scarab Warcharm. Charninja has a review. Wednesday, September 27, 2006 We shift planes a bit today with Oour Mini of the Day Review we take an exclusive look at Clawkiller, a fear character from the, not yet on store shelves, set Baxar's War. That guy that plays Dreamblade and Rolf have reviews only here on pojo.com. Monday, September 25, 2006 Our Mini of the Day Review is from the Fear family. We spawn Night Queen. Charninja and Rolf have reviews. Friday, September 22, 2006 Our Mini of the Day Review is from the Fear family. We spawn Eater of Hope. Charninja and Rolf have reviews. Wednesday, September 20, 2006 We have a Baxar's War Preview for you today. Scott Gerhardt has a preview and review of Tower of Faces in our News Section today. We'll have a couple of exclusive figures to show you over the next few days. For today, our Mini of the Day Review is another from Madness. We spawn Doomsinger. Charninja and Rolf have reviews. The 2006 Dreamblade 10K (that's $10,000) tournament series comes to Chicago on Oct. 14th and 15th. Check out their site for more info on that event. Monday, September 18, 2006 Our Mini of the Day Review is from the Madness family. We spawn Chrysalis Spinner. Charninja and Rolf have reviews. Friday, September 15, 2006 Our Mini of the Day Review is from the Valor family. We spawn Axemorph Demon. That Guy That Plays DreamBlade and Charninja have reviews. Thursday, September 14, 2006 Our Mini of the Day Review is from the Fear family. We spawn Carrion Spiker. That Guy That Plays DreamBlade, Charninja and Rolf the Ruf have reviews. Wednesday, September 13, 2006 Our Mini of the Day Review steps off the edge of sanity into the madness set. Today, we spawn Ego Cannibal. That Guy That Plays DreamBlade, Charninja and Rolf the Ruf have reviews. Friday, September 08, 2006 Our Mini of the Day Review finishes out our week of rare Valors. Our closer is Noble Dragon. That Guy That Plays DreamBlade, King Sephiroth, Charninja and king atlantis. Thursday, September 07, 2006 Our Mini of the Day Review seeks out a few rare Valors this week. Today, it's Falcon Soldier. That Guy That Plays DreamBlade, King Sephiroth, Charninja and king atlantis. Wednesday, September 06, 2006 Our Mini of the Day Review seeks out a few rare Valors this week. We start it up with Steelborn Griffin. That Guy That Plays DreamBlade, King Sephiroth, Charninja, king atlantis and Rolf the Ruf. Tuesday, September 05, 2006 We posted a Press Release we received about the Atlanta Dream Series Results. This is in our News section today. Sam Black of Madison, Wisconsin wins again! Friday, September 01, 2006 Our Mini of the Day Review plays upon your fears with Fleshless Reaper. That Guy That Plays DreamBlade, King Sephiroth, Charninja and Rolf the Ruf. Wednesday, August 30, 2006 This week, we continue to scare them up with our Mini of the Day Review and we spawn another one from Fear, Horrid Poltergeist. That Guy That Plays DreamBlade, King Sephiroth and Charninja have reviews. And, we welcome Rolf the Ruf. Monday, August 28, 2006 This week, we entertain our fears with the Mini of the Day Review and spawn Dreadmorph Ogre. That Guy That Plays DreamBlade, King Sephiroth and Charninja have reviews. 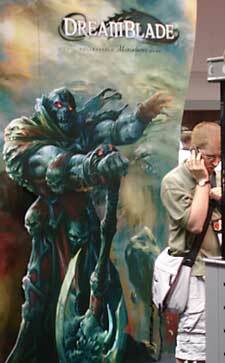 Friday, August 25, 2006 We enter the Dreamscape with our Mini of the Day Review and spawn Brighthammer Avenger. That Guy That Plays DreamBlade, King Sephiroth and Charninja hammer out some reviews. We enter the Dreamscape with our Mini of the Day Review and spawn Loyal Scragglemaw. That Guy That Plays DreamBlade, King Sephiroth, Charninja and king atlantis have reviews. Tuesday, August 22, 2006 We enter the Dreamscape with our Mini of the Day Review and spawn Unspeakable Freak. We have several new reviewers that will speak a lot about this freak from the madness collection. Welcome King Sephiroth, Charninja and king atlantis. Monday, August 21, 2006 Rolf put together an awesome PDF that is a spoiler with images and statistics. The PDF is broken down by factions. It's in the left-hand margin for future downloads. Nice work Rolf! Sunday, August 20, 2006 To make sure Dreamblade hits it big with players, Wizards of the Coast Inc. is backing its release with a half-million dollar tournament circuit. Check Pojo's Friday News for more details. Thursday, August 17, 2006 Today, we enter the Dreamscape with our first Mini of the Day Review and it's from a veteran gamer and staff member here at pojo.com. We spawn Screambent Lunatic. Our vet, Drizer, is joined at the portal by That Guy That Plays DreamBlade for our first review. Wednesday, August 16, 2006 We got our hands on the artwork for the Booster Packaging for the next expansion of Dreamblade: Baxar's War. We posted it in our News Section today. We plan on starting up the Mini of the Day this Friday. If you want to volunteer as a reviewer, feel free to Contact Us. We created a dedicated section for Dreamblade talk on our Message Board. You can gossip, discuss team building, discuss figures, discuss tourney, trade & more here. Tuesday, August 15, 2006 Hey, we have another new site to introduce to you today! Dreamblade is a new Miniatures game being produce by Wizards of the Coast. The first set was release last week, and Wizards of the Coast ran a $20,000 tournament at GenCon this past weekend. We posted a Press Release about the Tourney in our News Section today. If anyone wants to write a Tourney Report from this event, we'd be happy to post it. Pojo wrote a report about the Dreamblade presence at GenCon. This is also posted in the News Section. There are a handful of photos along with the report. We hope to have a Dreamblade Mini of the Day section opening for you soon. If you want to volunteer as a reviewer, feel free to Contact Us.